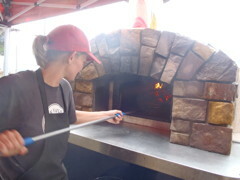 Krista is purchasing a mobile wood-fired pizza unit to supply markets, festivals, private catering and other regional events with “homegrown” pizza and other food items. 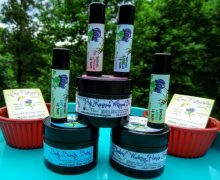 She is producing a highly value-added product using fresh, local and seasonal ingredients including vegetables, meats and cheeses from Balltown Bee Farm and her farming neighbors. Krista is using Pizza Love! as an educational opportunity to promote local foods and farming through hands-on demonstrations and customer participation in workshops. 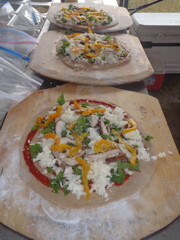 She plans to take the mobile oven to community school gardens and prepare pizza right in the gardens. She also wants to offer a healthy food option at festivals—as opposed to funnel cakes and fried foods. 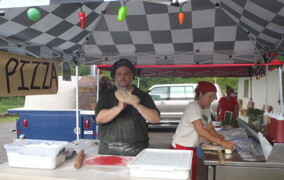 The pizzas cook in 90 seconds, so are perfect for farmer’s markets, fairs and private parties. Balltown Bee Farm will increase the production of vegetables for Pizza Love! to purchase, putting to use the farm’s specialty crops such as garlic and shiitake mushrooms. Krista’s father runs a similar business in Washington State and recouped his initial investment in three months with six multi-day festivals.